Bahia de Kino is home to between 5,000 and 7,000 permanent residents. The area is visited by both local and international tourists. There is a small, but active population of foreign residents, many of whom have built homes in town. The town is administered as part of the municipality of Hermosillo. It is located on land that was part of the traditional territory of the Seri people who now live to the north on their communal property. Despite the town's location and economic importance, there are no harbor or port facilities (other than the Port Captain's office). All fishing activities are based off the beach to the southwest of town. Two public boat ramps are available; one in the town (located at the Islandia Marina RV Park) and a second 6 miles (9.7 km) north-west of town. Local people differentiate between Kino Viejo ('Old Kino', the site of the original village and main commercial center today) and Kino Nuevo ('New Kino'). The latter refers to the homes, motels, RV parks, and restaurants that line the coast for several miles north of Kino Viejo. 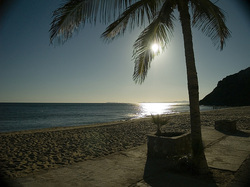 The quiet village of Bahia de Kino nestles into the western coast of Sonora. Until the 1940s this area was almost completely unpopulated except for a few fishing camps, and small bands of Seri Indians who caught fish from wooden canoes and gathered shellfish along the shore. This is a rugged and sun-drenched land where ancient volcanic mountains meet the bountiful Sea of Cortez, where frigate birds migrate through by the thousands, where dolphins cruise the shore, and where the Seris carve ironwood and weave highly-prized baskets of the finest quality. ‘Kino’ is a friendly town in a beautiful natural setting, where the cost of living is low, if you shop where the locals do, and where a few adventurous retirees have chosen to live comfortably as part of the local community. Even today, Kino Bay remains an unspoiled and ‘undiscovered’ piece of the long Sonoran coastline – where the desert meets the Sea. Kino Bay is very close to the US border, an easy day's drive south of Tucson, yet it’s not overwhelmed with tourists. Kino is not on the way to anywhere else. It’s at the end of a 110 km (65 mile) highway. The Estado de Sonora has invested heavily to build a good, wide, two-lane road with wide paved shoulders. There are no modern chain hotels with tour packages and large ad budgets, yet decent, clean and affordable lodging is available to those willing to seek it out. First-timers usually check out good places for a return visit. There are no US-style chain food outlets. There are many small local restaurants that serve up very good seafood fresh from the ocean. There is a very good ‘agua purificada’ system here and things are generally sanitary. 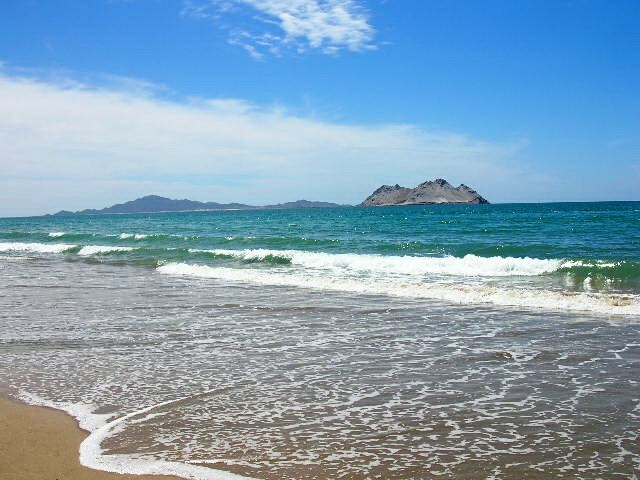 Kino is popular both for long-term winter visitors from the US and Canada, and families from nearby Hermosillo spending a weekend at the beach. Businesses here cater to both the local and international trades. During the summer months of July, August and early September the air temperature can be very hot (often over 100 deg. F), although the Sea is wonderfully warm for swimming. During the Christmas/New Years season the air temperature is generally pleasant, and nice for long morning walks on the beach or an evening stroll to a restaurant for dinner, while wearing only a light jacket. But the water temperature is often in the high 50s to low 60s during December through March and not many people go swimming then. While the sunsets and scenery are always beautiful here, the best times to be in Kino are usually May-June, and September-October when air and water temperatures are about as close to perfect as you’ll find anywhere.